Pretty soon, we might be relying on robots for room service. A Santa Rosa, California startup by the name of Savioke have designed a robotic butler - quite fittingly named Botlr - which it intends to see installed in hotels all across the country. 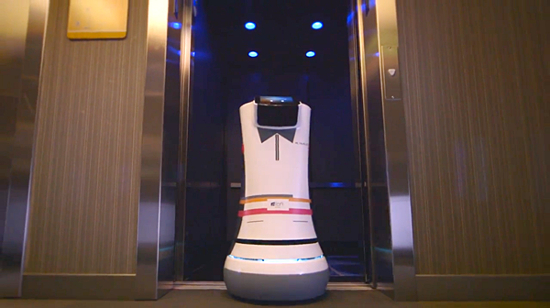 Fully autonomous and programmed with a full map of every hallway, guest room, and elevator of whatever hotel it works in, Botlr finds its way around obstacles by making use of the very same laser-powered sensor technology that drives Google's robotic cars. The way it works is simple - after a guest calls the front desk with a request, the robot can be programmed for delivery with a few button presses. Presumably, this process can be further streamlined to allow guests to order room service entirely from their computer, without any help from the hotel's human staff. Now, the primary weakness of Botlr is that it can only be used in a hotel that's specifically designed for it. That's because in order to make its way around, it taps into the building's wireless connection. It then uses the WiFi to operate elevators and notify hotel patrons of its arrival at their rooms. In other words, without the right infrastructure in place, Botlr's really just an overly-expensive scale model of R2D2. Currently, Botlr is undergoing a test run in Starwood's Cupertino-based Aloft hotel. For four days a week, it roams the halls of the hotel, handing out snacks, toothbrushes, and other amenities to guests. Once this test run is done, Savioke plans to open up the pilot program to other hotels and chains at some point in 2015. Of course, beyond that, the organization believes its invention can do a whole lot more than act as catering staff. "We believe the devices could also be used in restaurants, hospitals, and elderly care centers," explained Savioke CEO Steve Cousins to The Wall Street Journal.